Paola Arlotta, chair of and professor in the stem cell and regenerative biology department at Harvard University, is growing brain tissue in her lab. In recent years, scientists have developed new techniques that add another level to the two-dimensional tissue culture of yore (e.g., growing cells in a single layer in a petri dish). These cells grow and divide in three dimensions, ultimately giving rise to samples of tissue that resemble the organ itself. They’re called organoids, but many news headlines have described them as if they are real, live organs. Take these headlines for example: “Scientists grow human brains in a dish” and “Scientists brew up the creepiest batches of brain balls yet.” While science is in its infancy, the headlines don’t reflect that, taking liberties in describing what organoids are and overstating their form and function. “You imagine a mini brain in a dish — that’s not what these things are,” Arlotta stresses. That bears repeating: They’re not mini brains; they’re not brains in a dish. They’re brain organoids, simplified replicas with some of the features of the organ they model. Put simply, they are models that allow scientists to see how different cell types within a structure interact with one another, said Carla Kim, a professor of genetics at Boston Children’s Hospital. 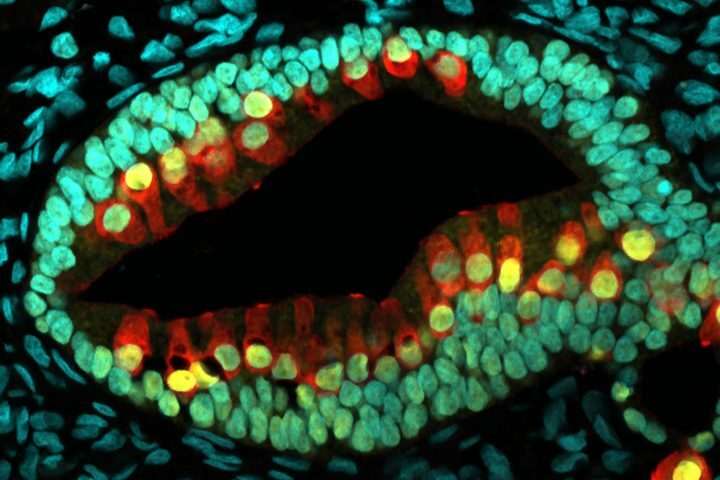 They can also be used to study selected, specific events of tissue development that may not be possible to study in vivo, like aspects of development of the brain, Arlotta said. Though they’re not brains in a dish, organoids still contain a world of possibility for researchers, Arlotta said. Organoids have therapeutic potential, allowing researchers the possibility to test cancer treatments, for example, on a lab-grown sample of a patient’s tumor, or cystic fibrosis treatments on a patient’s gut organoid. But on a more basic level, organoids offer a new window into human development. “Watching the primitive early steps of brain development in a dish is watching, for the first time ever, how our brain is made,” she said. “Something that we never, as humanity, have seen before,” or will see, otherwise, in the future, she added. By comparing a human brain organoid to those generated from other species, “one can watch evolution at play,” she continued. It’s akin to the exploration of outer space, she said. “We can begin to understand what brought us this incredible power,” she said. How can journalists improve their coverage of this emergent field of research? Arlotta, along with other organoid researchers and a bioethicist, spoke with Journalist’s Resource to offer advice. That, he said, was the “advent of organoids,” a field of research that has made rapid progress over the past 10 years. At the most basic level, an organoid is a “mass of cells organizing themselves to make an important structure,” Kim said. What does that mean, exactly? Kim gave an example from her own work, which focuses on the lungs. The basic unit of the lungs that facilitates gas exchange (i.e., that release oxygen into and accept carbon dioxide from the blood) are called alveolar sacs. Kim’s lung organoids don’t look like little, complete lungs, inflating and deflating on their own. Rather, they resemble a part of the organ, such as an alveolar sac. Step 1: take some stem cells. Stem cells are a kind of cell that become many different types of cells found in the body. They can be derived from embryos (embryonic stem cells) or adult skin or blood cells that have been reprogrammed to become stem cells (induced pluripotent stem cells). Scientists then grow these stem cells into a three-dimensional cluster, also known as an embryoid body. From there, if they want to grow a brain organoid you have a few options, “experimenters very minimally tweak outside conditions to allow the brain to self-emerge,” or “you can add specific signals through the media [the fluid in which organoids are grown] that bias the embryoid body to generate a specific region of the brain,” Arlotta explained. In other words, because embryoid bodies can grow into many different types of tissues, scientists must add certain compounds to the fluid that provides cells with the necessary nutrients for growth to steer their development in a certain direction. From that point on, experimenters can further guide growth to recreate a particular region of the brain, or they can take a backseat approach, allowing the cells to direct their own growth, dividing and forming various cell types and structures of their own accord that resemble the cells and structures you’d see in a normal human brain. Organoids don’t fully recreate the normal processes of human development — it’s more limited than that, Arlotta said. They replicate only some aspects of human organ development. They aren’t mature, so they only offer a window into early tissue development. They aren’t vascularized on their own (although they could be engineered to be so). Because they don’t have connections to blood flow, they need another source of oxygen (for example, Arlotta’s organoids are grown in fluid-filled flasks that are perpetually stirred for oxygenation). They aren’t necessarily functional. For example, even when Kim adds external blood vessels to her lung organoids, they don’t exchange gas. They aren’t big. Arlotta’s brain organoids grow to a maximum size of 4 to 5 millimeters in diameter (as a comparison, a dime is 18 millimeters in diameter). Journalists should keep the nascent state of the field in mind as they report on organoid research. “The usual common mistake I see journalists make is to sort of immediately jump to something that’s very far away or might not even be possible,” said Insoo Hyun, a professor of bioethics at Case Western Reserve University School of Medicine. “Resist the temptation to immediately jump to scenarios that are thought-provoking and striking but very far away,” he cautioned. For example, their therapeutic potential might be overstated, as well as their potential capacity for complex functions (e.g., the “brain in a dish” framing). And while we may anticipate bioethical concerns about organoids with more complex functions in the future, it’s important to neither over- nor understate these issues, Rubin said. “I think that doesn’t serve anybody well,” to dismiss ethical concerns outright, he said. Rubin suggested describing organoids in a “more scientific way,” to highlight their functions and limitations, while also treating concerns with legitimacy. In the same vein, Hyun advised reporters to provide sufficient context regarding organoid research. Tell your readers why it is being conducted. Don’t leave them with a mental image of a mad scientist, or a reckless scientist, conducting experiments to “fool around and have fun,” Hyun said. Instead, describe the scientific rationale and humanitarian purpose of the research. Need pointers on covering health research or viral (in the internet sense) studies? Look no further! Photo by National Institutes of Health obtained from Flickr and used under a Creative Commons license.